What even is the INF, or Intermediate-Range Nuclear Forces, treaty? 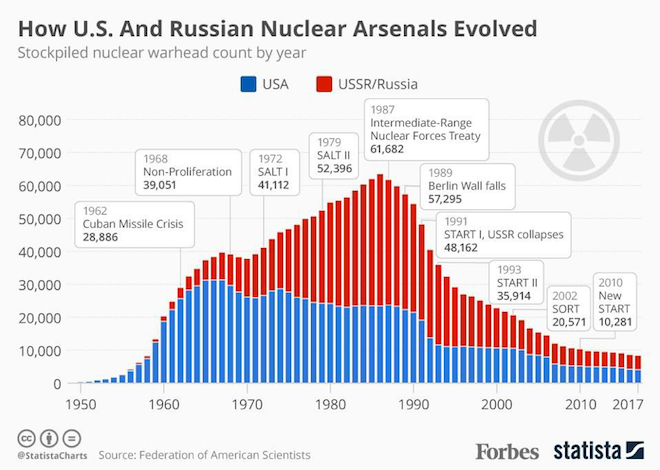 To answer that, we have to throw it back to the tail end of the Cold War when the U.S. and the Soviet Union were in the midst of flexing their missile stockpiles at each other. After both the Soviets and the Americans started putting these weapons in bases in Europe, President Ronald Reagan and Soviet President Mikhail Gorbachev agreed that the situation was getting out of hand. At that point, many of the missiles fell under the Intermediate-range nuclear forces (INF) category as they could hit their targets in as little as 10 minutes after being fired. To cool things down, the two countries jointly agreed to the INF Treaty in 1987. It prohibited all land-based missiles with intermediate ranges and ordered the destruction of a combined 2,500 missiles between the two powers. After the Soviet Union dissolved, the treaty carried over to Russia and has now been in place for more than 30 years. Okay. So if it’s kind of old, why does it matter now? On Feb. 1, the Trump administration announced that the U.S. will withdraw from the treaty in six months unless Russia agrees to destroy their intermediate-range missiles, which, if you ask Russia, actually don’t exist in the first place. So, why did Trump say he’s going to back out? In Trump's view, the U.S. pullout maintains the moral high ground. Russia appears to be in violation of the INF Treaty, though they refuse to admit it. If Russia is violating the treaty, the Trump administration can argue that it’s in the country’s best interest to back out before Russia can get too far ahead in terms of missiles. But the problem is that this potential danger isn’t new. Russia’s alleged violations go back to the Obama administration in 2014 when the missiles were first suspected. At the time there seemed to be no imminent threat, so the U.S. decided to stick with negotiation to settle the dispute rather than withdrawing from the treaty. What makes it different now is that there’s another country entering into the mix. Recently, China has been building up their supply of missiles, especially missiles that fall under the INF category. As the U.S. is currently bound by the INF Treaty, it’s in a bit of a weak spot when it comes to matching defenses with rival power China. Russia is giving the U.S. the perfect excuse to get out and build back up the American arsenal. Wait, does that mean there’s going to be another Cold War? There’s no way to really predict anything with full confidence, but Trump has stated that he is ready to build American forces to match China and Russia with the intent of intimidation. If you know anything about the Cold War, you’d recognize this as a bad sign, since intimidation was one of the main factors that fanned the flames of the conflict. To make matters worse, it seems China isn’t necessarily holding back with its production rate. For what it’s worth (which may not be much), Russian President Vladimir Putin has stated that he doesn’t want to get into an arms race right now. Whether actions will back up these words is still up in the air. For right now, there’s nothing much we can do but wait and see.